Translation: Take a new saucepan, put carefully peeled chestnuts in it, add water and a little soda and set it to cooking. While it is cooking, crush in the mortar pepper, cumin, coriander seed, mint, rue, laser root and pennyroyal. 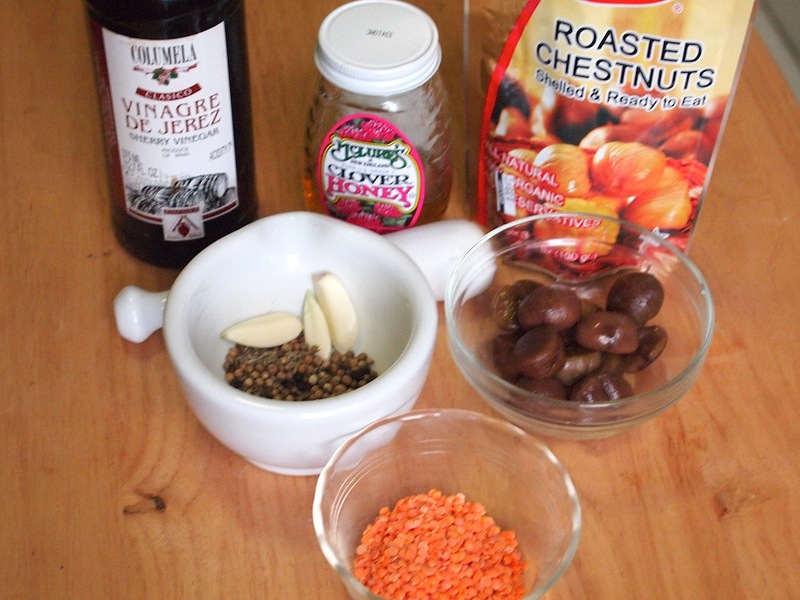 Moisten with vinegar, honey, and fish sauce; add vinegar to taste and pour over the cooked chestnuts. Add oil and bring to a boil. When it is simmering, crush the nuts as you would in the mortar. Taste to see if something is missing and if so, put it in. When you have put it in a serving dish, add green virgin oil. So, here I was with two recipes with partially overlapping ingredients…many of which (rue, pennyroyal, laser) I couldn’t find in grocery stores. Or even in the many specialty stores in New York. I really loved the idea of combining lentils and chestnuts, though, and I needed a vegetarian main course for guests not so into my bloody lamb roast…so I pulled a few things together. For one thing, I totally cheated with the chestnuts: I really hate shelling them, and my corner grocery sells bags of vacuum-packed roasted nuts for $1.99. I pared the ingredient list down, generally, to make this dish more modern. The Roman penchant for adding honey and vinegar to everything really worked here, though: many modern recipes still add acid to lentils. The meatiness of the nuts balanced out the sweet-sour flavor. I chose to leave those nuts whole (to keep texture) instead of pounding them with a pestle as Apicius suggests. This dish was really easy and flavorful, and worked beautifully with a slightly adapted bulgur pilaf from Martha. 1. Heat the oil over a medium flame, add the garlic, and cook for about 30 seconds. Toss in the leeks and cook about 2 minutes, until they start to get tender. 2. Add the chestnuts, cumin, coriander, and pepper and stir a couple of times, then pour in the lentils and water. 3. Bring the mixture to a boil, cover, reduce the heat to medium-low, and simmer for 20 minutes until the lentils are tender. Add the honey and vinegar, mix thoroughly, cook a minute more, and serve over bulgur pilaf. 1. Toast the bulgur over medium-high heat in a medium saucepan, stirring frequently, until golden and fragrant (4 to 5 minutes). 2. Pour in the stock and 3/4 cup water, and add the cinnamon stick, bay leaf, and 1/2 teaspoon salt. Bring to a boil over medium-high heat, cover, and reduce heat to low. Simmer about 10-12 minutes, until all liquid is absorbed and the bulgur is tender. Season with salt and pepper and serve. Sounds lovely, I’ve gone vegan & gluten free for a month so will try this with quinoa, thanks! Very cool recipe! I love those spices. Well done, ancient people! I love lentils, so I’ll totally try this recipe! It was only just this year that I realized how much I love chestnuts…what a great dish! I’ll definitely be trying this out!